CiCiCat Bike Phone Holder,Universal Bike & Motocycle SmartPhone Mount, Anti-Slip Design Easy Installation for Huawei P20, iphone x/8/8 plus, Samsung Galaxy S9 and other 4.5-6.5 inch Smartphone. 1.This universal bike & motocycle cellphone mount can be simply and quickly installed on the handlebar, letting you enjoy music and handsfree call during riding. With adjustable length, this phone holder is fully compatible with 4.5-6.5 inch mobile phones. 2.High stability, super durable, Four-claw clip can keep your phone more fixed. 3.Cushioning strong adhesive patch, non-slip and shockproof. 4.Fit for 22-33mm handlebar diameter. Suitable for road bikes, mountain bikes, etc. 5.It is totally an awesome choice for you. Eco-friendly material, new fashion design, easy to use, hold your phone firmly and safe, universal compatibility. ★Perfect Protection: Non-slip rubber grip cradles of bicycle phone mount secures your device all-around to guard against any falls. Protect your device on your each thrilling bicycle journey. ★360 DEGREE ROTATION: This cycle phone holder has built-in rotation ball, the bracket can rotate 360 ° to meet the needs of swivel riding at any angle. ★Eco-friendly and Durable Material: It uses environmental protective high tenacity silicone which is good to our environment and to human beings. Also this material is durable and is not easy to wear out. 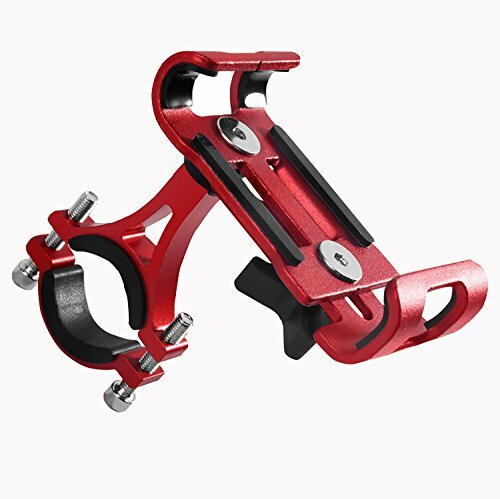 ★High stability, super durable, non-slip and shockproof, Four-claw clip can keep your phone more fixed, Fit for 22-33mm handlebar diameter. ★Quality Guarantee: This product has a one-year warranty. If you had any issues, we will provide you great after sale service. If you have any questions about this product by CiCiCat, contact us by completing and submitting the form below. If you are looking for a specif part number, please include it with your message.